Apples to Zinnias, Brazilian Embroidery book, by Maria A. Freitas contains all the essential stitches and techniques for creating beautiful Brazilian embroidery. The A to Z includes clever little designs such as: a cute little snail, an umbrella, an apple, and a zinnia to name a few. Pre-printed fabric design measures 12 x 21 inches (30 x 53cm) with fabric measuring 18 x 27 inches (45 1/2 x 68 1/2cm). 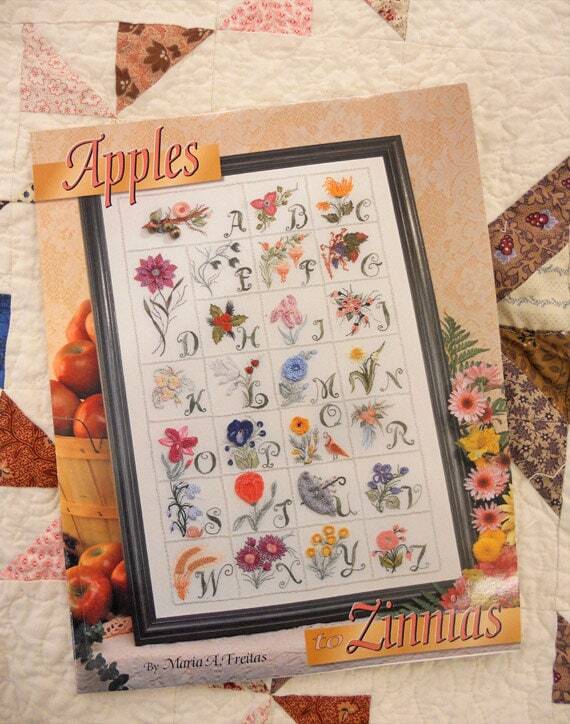 This book has clear and concise instructions and techniques for creating the Apples to Zinnias framed piece of Brazilian embroidery along with a guide to needles, threads, along with an index. There is also a full-color, fold-out page for a close-up view of the different letter blocks. Pre-printed fabric is trigger cloth and comes pre-printed with the Apples to Zinnias design. White and Cream are printed with washable blue ink and black is printed with removable chalk. this listing does not include thread, beads, wooden apple forms, beads, needles, or floral wire. 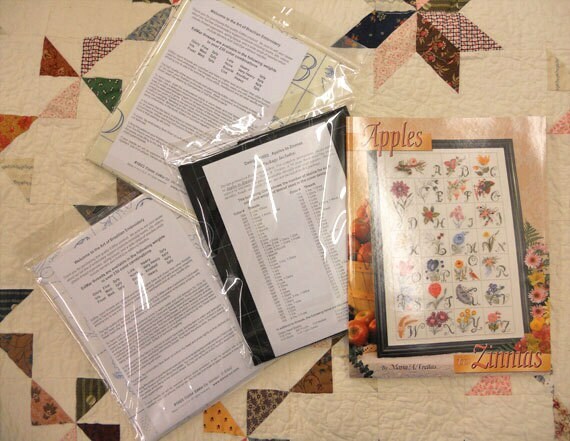 this listing includes: book AND preprinted fabric only. There is an embroider along on our blog www.sweetgirlstudio.wordpress.com...be sure to check it out! Excellent Etsy transaction. Great communication skills. Packaged great. Just what I wanted. Thank you.